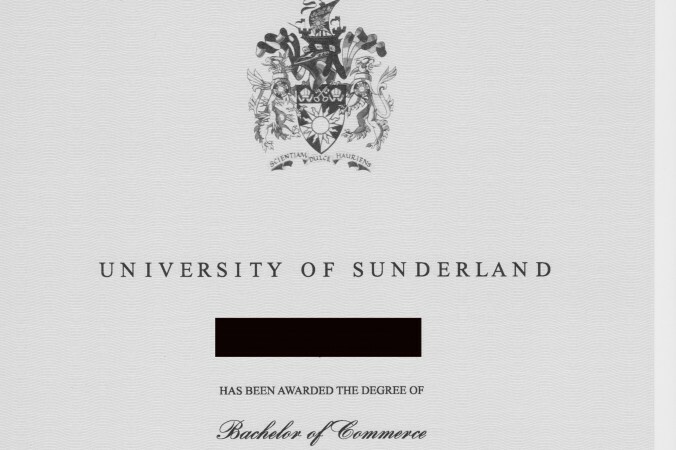 Zhou Yexian didn’t want to talk about how she got her fake diploma from the University of Sunderland, nor how much she paid for it. “Sorry, you’ve got the wrong person,” she said, after confirming her identity in a telephone call one morning from a reporter who had obtained her curriculum vitae, fake university diploma, fake academic transcript, and a notary’s certificate saying that they were in fact all real. The number of people like Zhou (not her real name), who have deployed fabricated educational qualifications to boost their careers, is impossible to know. Websites in Chinese, however, offer an array of options for those with the money to spend: without leaving the computer, one could order a fake diploma and an academic transcript from New York University, Purdue University, or institutions of higher educations in Australia, Canada, China, and Japan. In the case of Zhou Yexian, whose name Epoch Times has altered to guard her privacy, counterfeiters probably took a more customized approach. Epoch Times learned of and obtained Zhou’s problematic credentials from a peer in Singapore, who obtained them from an intermediary when they were both there studying. Zhou’s peers, after discovering the fabrication—and finding that she had scored a “fancy job” in Beijing—were incensed at what they thought was the unfairness of the situation. They began enquiring discretely about how the process works, and, after noting an Epoch Times article about bogus universities in China, contacted the paper. Counterfeiters approach clients—mostly international students—in Singapore, take their money, print a fake diploma in another country, then ship the papers back to Singapore, Stacy B (not her real name) said. These items closely mimic the diplomas granted by the actual universities, and come along with detailed academic transcripts. In Zhou’s case, her fabricated transcript shows three years of study at the University of Sunderland in the United Kingdom, for which she earned second-class honors in a Bachelor of Commerce, majoring in business management. Her highest fake score was 83 percent for a course on organizational behavior. With diploma and transcript in hand, counterfeiters then walk into any number of law offices in Singapore and obtain genuine notarial certificates that say the diplomas are real. Sally Choo, an assistant at the Lim Hin Chye & Co. legal firm in Singapore, run by Mr. Lim, a notary public, confirmed that the notarial certificate for Zhou’s fake diploma was real. Along with the notarial certificate was another certificate from the chief financial officer of the Singapore Academy of Law, showing that the notary, Lim Hin Chye, is real. This certificate was also confirmed to be real by Low Hui Min, the chief financial officer, in an email. The fakery began when the counterfeiter walked into Mr. Lim’s notary office. Sally Choo, the receptionist and an assistant there, did not remember having that particular diploma notarized; she said via telephone that they have no way of confirming the veracity of the documents that they notarize. “It can be anybody” that walks in, she said. “The degrees look real. You can’t even tell if they’re real or fake.” When a reporter explained that there are websites that sell degrees of this kind, she said “You can buy the degree online? Oh my goodness.” Choo said that in the cases where they have suspected a degree to be fake, the schools have taken months or more than a year to respond. So what is the point of the notary? “The notary public is to check the originals and photocopies. If you give the original, we’ll stamp it,” she said. The notaries also receive $75 Singapore dollars (US$60). “If we don’t do it, they will go to another notary public,” Choo said. Three staff from the University of Sunderland said that they had no record of Zhou’s attendance at their university. In a follow up email two weeks after being contacted by Epoch Times, Steve Heywood, the head of communications at Sunderland, wrote to say that it takes fake certificates extremely seriously. The university does everything in its power to combat fake degrees, he said. Purdue University said in an email that they report all earned degrees with the National Student Clearinghouse, which prospective employers can consult for a charge. Stacy B said that when she and her friends contacted Zhou’s current employer, attaching an email from the University of Sunderland demonstrating that her credentials were not real, the employer took no action. A search of the Chinese Internet shows that there are at least dozens of websites selling fake degrees—Bachelor of Arts, Bachelor of Science, Master of Arts, and even doctorates in subjects from animal science to interdisciplinary oncology.